A few days ago I published a video called "London in Fives" on Vimeo. In this article I explain how I made this, including the hardware and software that I used. There are 25 scenes in this video, each taking 5 seconds. Because the frame rate is 25 fps, that means there are 125 frames per scene. All those numbers are powers of 5, hence the title of the film: London in Fives. The first and last scenes are merely the title and end credits, and are just a series of images. The more interesting bits are the 23 scenes in between. All these scenes are made from single frame shots from my Nikon D300 DSLR camera. It has a feature that allows a picture to be taken every 5 seconds automatically. For all scenes, except for the night time shot of Covent Garden and the Ice Skating, that created the raw images. For each scene, I usually took a few more shots than the 125 required, usually up to a 150, to have a bit of a choice of where to start and end the scene. 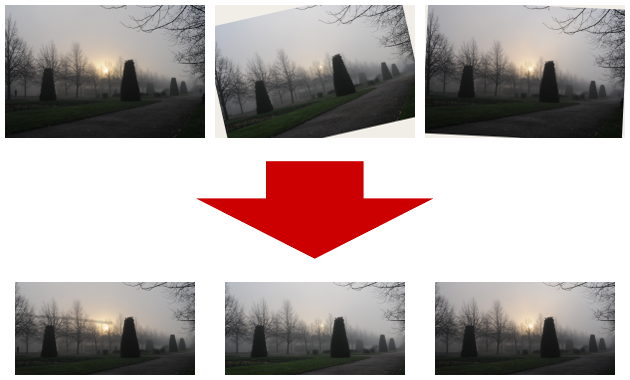 In one case (the Regent's Park sunrise in the fog scene), I was happy that I did! Due to a hard drive failure I fortunately managed to only lose a few images, so that I still had just 125 left! Of course it is important to keep the camera steady between all of the shots. In most of the scenes I used a GorillaPod, a three legged flexible tripod where each leg can wrap around objects. In the later scenes, I used a normal stand-up tripod, a Manfrotto befree. The camera movements are all done in post production, except for the night time shot of Covent Garden and the Ice Skating scenes. Instead of using my camera's "take a photo every x seconds" feature, I relied on hardware to take both a photo every 5 seconds, but also rotate the camera slightly on top of its tripod. The time lapsing device that I used to rotate and instruct the camera to take a photo every 5 seconds is an Astro. This is a disk like device that can rotate around one axis and instruct the camera through a cable to take a photo at specific intervals over a certain period of time. I think that for future time lapses I will not rotate more than 30° for a 125 scene shoot as otherwise it goes a bit too fast. To make sure I had my camera perfectly horizontal on my camera, I used a spirit level that sits on top of my flash socket. After taking the photos, some post-processing was necessary. There are three types of post-processing that I had to do, depending on how the photos were shot. For the two scenes created with the Astro, I really only had to rescale the photos from the camera's native resolution to 1280x720. I first also tried enabling GPU support for remapping, but that just ended up crashing the tool. The tool here is called with an output prefix of aligned/a and the -C auto-cropped the image sequence so that it covered an area that all images shared. After the image alignment for this particular scene, I could process it the same as the other 20 scenes that were not taken with help from the Astro. For the sequences not taken with the Astro, the resulting video still shows camera movement. This is absolutely artificial, and is basically done by cropping the right section out of each image. I varied the size and location of the cut out sections for each image to emulate a moving, and zooming camera. For one scene, the Oxford Circus crossing one, I also had to adjust rotation as the horizon wasn't flush. The rotating and cropping was done through fairly simple PHP scripts using the GD library. This script loops over all the images in the sequence (9800 to 9824). Given the x, y, width and height values for the beginning and end images of the sequence, it calculates the intermediate coordinates of where to crop from. 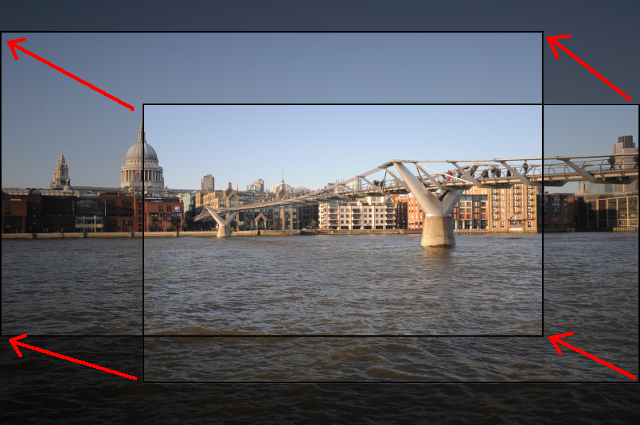 Before cropping, the script uses convert to rotate each image by 1.7 degrees to put the horizon horizontal. After the rotation is performed, the call to imagecopyresampled cuts out the right part of the original image and scales it down to the target frame size of 1280x720. Which basically means: use 125 frames starting from image number 5711 in directory 12-south-bank/small/ with file format tl3_%04d.jpg at 25 frames a second. The codec is vp8 with a video bit rate of 50mbit and a rescaled result of 1280:720 pixels. The -crf 8 selects ultra-high quality for vp8. The output file is 12.webm. I wanted ultra high quality for each scene, as later on I would be re-encoding all the scenes into the final video file, keeping as much image definition as I could. I have been a fan of Kevin MacLeod's Creative Commons licenced music for a while, having used it for some of the newer OpenStreetMap edit videos. In this case, I did not want to release the video under a Creative Commons license so I paid for one of his tracks: "Touching Moments Four - Melody". With audacity I added the 5 beeps at the start, and I also slightly stretched the sound to cover the full two minutes that I needed it to last. I think the speed was reduced by about 8%. This does make the sound a bit lower in pitch, but I do not think it hurt its original composition. I hope you enjoy the video as much as I did doing all the work for this!